Welcome to the brand new Gatto. New look, new approach, new process, new everything! 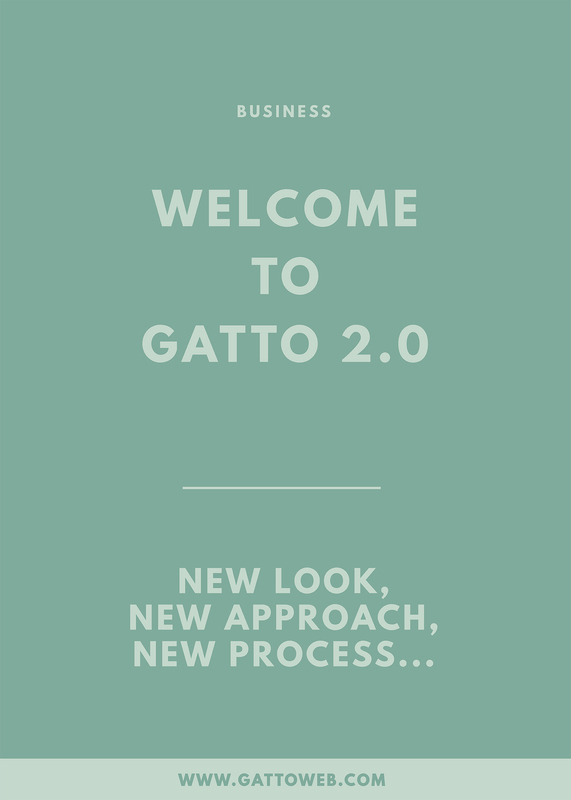 I am planning on writing another blog post about the reasons behind the changes but for now, let’s talk about Gatto 2.0. Firstly, I have brought in new more streamlined services. I will be offering one package for all, made especially for other creative businesses, including a full brand design and a website design built on Squarespace, a platform I have been experimenting with over the past few months and have absolutely fallen in love with. It encompasses everything I love about design, simplistic and easy for clients to use. Next, I have created a new design process which means I can work one to one with each client to recognise their vision for each separate brand. The process is something I have been pouring my heart into for a while to make sure it is as enjoyable for the client to work through as it is for me. The process has been cut down to four weeks from start to finish, with all the work split into each week and regular updates given to each client. Week One – In depth client homework including brand ethos and direction, inspiration for the brand and a detailed Pinterest board to collect all thoughts visually. Week Two – Initial brand mood board and colour palette creation to set the foundations for the rest of the identity. Week Four – Website creation incorporating the brand built on Squarespace and full launch at the end of the week. The process will require in depth work with the client which is one of the parts I most love about working in design. I love to get feedback and continue to improve and evolve the direction of the brand as the process goes on and a quick turnaround time means we can have detailed conversations and react on that straight away. Finally, the new website is something I am massively excited about. The previous website was built on Shopify which didn’t give much room for change and as a website designer, having a website I wasn’t 100% happy with was a definite drawback. I wanted people to see straight away what they could get from working with me and it just wasn’t cutting it. With Squarespace being a less restrictive platform, I could design absolutely everything from scratch and make it look exactly how I wanted it to look. I am incredibly excited to get started on the new process and working with new and exciting clients to help them build their brand and grow their business. If you’d like to work with me, get in touch and we can discuss your vision!